I love the Washable Wednesday feature! These days, machine washable is the number one feature I look for in clothing. 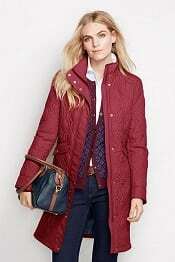 Could you do a round up of professional, machine washable winter coats (i.e., warm enough to wear in the Northeast)? Innnnteresting. Here’s a fun story about me: after my first was born, as mentioned, I was way bigger than I’d been at any point in my life before — joy. I tried to muster up some groove and figured, I can have an AMAZING winter coat, no matter what size I am — I want to love it every time I walk out the door. It’ll make sense even though I work from home, and I’ll still be able to be fashionable and feel beautiful. So I spent some money on a nice Cinzia Rocca wool/cashmere coat, in a lovely dark green color. It looked nice with jeans — it looked nice with dresses. I could have fun with colors and wear my purple Loro Piana scarf with it, or I could go darker and wear black with it. It was perfect. Fast forward to a few weeks after getting the coat, and it was my turn to pick my son up from daycare. I arrived, happily wearing my coat, and went about the usual routine of collecting his stuff. As per usual, I gave him a healthy snack to help his mood before dinner. The healthy snack was one of those yogurt mashes… and it did not help his mood. At some point on the 15-minute walk home, it turned into a Major Toddler Meltdown, and the yogurt, somehow, was everywhere — covering him, his little face, his coat, his stroller. It was pretty cold outside so I focused on getting him home, gritting my teeth the whole way. When we got to the vestibule of our building, he leapt out of the stroller and turned to me, arms outstretched, still shuddering/sighing/sobbing. Without thinking about it, I scooped him up into one of those mama hugs — the ones where you’re part sorry for him that he was in such a miserable Meltdown place, and part so so relieved that it seems to have finally run its course. And THEN I remembered: I was still wearing my new beloved wool coat — and he was still totally covered in yogurt. Rethink when you wear your winter coat around your kids. If you live in a car culture, do you really need to wear it walking from the parking lot to the building? Would something lighter (like an insulated vest, 0machine washable puffy jacket, or even a washable wrap or ruana) work for that walk? Patterns hide stains better than solids, particularly dark patterns — and they can be a chic way to inject some fashion and some personality into an otherwise boring outfit. Add a swipe of red lipstick and it can be full on glamorous. Remember that a lot of wool coat instructions say “dry clean,” not “dry clean only“ — that traditionally has meant that you can, in theory, wash it. I’m not sure I’d throw it with abandon into the washing machine, but after a bit of spot testing in an inconspicuous space, spot cleaning the coat may be the way to go. Buy an inexpensive coat. I really hate to recommend/encourage disposable fashion — it’s bad for so many reasons! — but I will say that you can often find very, very inexpensive coats where, if a yogurt meltdown happens, they can be your backup while your other coat is at the cleaner’s. 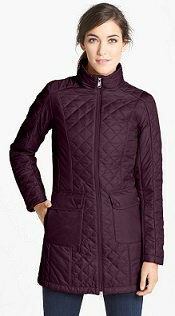 Lands’ End regularly has coats in their OTC section, where I’ve gotten crazy deals — they currently have two women’s winter coats priced $44-$59. (Update, Feb. 2016: OTC is no more, sadly.) Stores like Old Navy, Target, Forever 21, TopShop all carry really inexpensive coats as well. Thrift stores may also be great for this purpose. OK, on to the machine washable options… Readers, do you have washable winter coats? Do you have any tricks to avoiding yogurt-covered meltdowns? Like this feature? Check out other recent installments on Corporette! Sooo, what happened? Did the yogurt come out of the coat or was it stained forever? It was out of commission for a few days for dry cleaning, but it was fine — thank goodness his snack hadn’t involved something greasy like olive oil or melted cheese! Anyone know anything about the Uniqlo ultra light down? Is it warm? I find it hard to believe it could be warm at that price. (I need something for my ten minute walks in negative twenty degrees; last year I used a knee length LE puffer which was great.) I really like it and only need it to last a winter or maybe two. Also, what is Uniqlo’s fit like? I’m 5’10” and slim. Great advice! My LL Bean Commuter Trench Coat has been through a few winters, and I still love it! The lining is really warm, and the shell zips off and can be machine washed. I’ve gotten all kinds of stains out of it with zero problems. You can wear it without the lining in warmer weather, too. I think it was like $100, so very reasonably priced to boot. I have the North Face jacket – it runs small, but I find it plenty warm for relatively mild winter temps (high 40s-50s). I like it more because it doesn’t have a huge, obvious logo like so many other North Face items. Since I live in a car-centric place, I’ve gotten away with a lighter weight water resistant jacket that is sized up to fit a fleece under it if I really need the warmth. Basically, a DIY 3-in-one jacket that I can wear now through spring. Its pretty borderline mom coat though. I also need to look into a “coat I can wear in the Polar Vortex to shovel snow” new coat this year. I’m upset that LL Bean stopped making their full length washable wool coat. This coat is warm and goes down to the tops of the feet! I still have mine, but after years it’s getting ragged.